Who should not take Pindolol? This medication is used alone or with other medications to treat high blood pressure. Lowering high blood pressure helps prevent strokes, heart attacks and kidney problems. Pindolol belongs to a class of medications called beta-blockers. It works by blocking the effects of certain natural substances (such as epinephrine and adrenalin) on the heart and blood vessels. This results in a lowering of the heart rate, blood pressure, and strain on the heart. Inform your doctor if your condition persists or worsens (e.g., routine blood pressure readings increase). What conditions does Pindolol treat? Medications in this class may cause or worsen heart failure. Tell your doctor right away if you notice any of the following unlikely but very serious side effects: swelling of the feet/ankles, shortness of breath, severe tiredness, unexplained/sudden weight gain. Tell your doctor right away if any of these unlikely but serious side effects occur: bluish color of the fingers/toes/nails, hair loss (reversible), mental/mood changes (e.g., confusion, depression, memory problems), pain/cramps in the muscles/joints, numbness/tingling, decreased sexual ability, vision changes, slow/irregular/fast heartbeat, severe dizziness/fainting. List Pindolol side effects by likelihood and severity. This medication should not be used if you have certain medical conditions. Before using this medicine, consult your doctor or pharmacist if you have: asthma, very slow heartbeat (e.g., sinus bradycardia, second- or third-degree atrioventricular block), a certain serious heart condition (cardiogenic shock), uncontrolled severe heart failure. Before using this medication, tell your doctor or pharmacist your medical history, especially of: severe allergic reactions (e.g., anaphylaxis), breathing problems (e.g., chronic obstructive lung disease-COPD, emphysema, chronic bronchitis), blood circulation problems (e.g., Raynaud's disease, peripheral vascular disease), low blood flow to the heart/brain (e.g., due to coronary artery disease, stroke, transient ischemic attack), diabetes, heart problems (e.g., heart failure, heart attack), kidney disease, liver disease, mental/mood disorders (e.g., depression), a certain muscle problem (myasthenia gravis), overactive thyroid (hyperthyroidism), a certain type of tumor (pheochromocytoma). What should I know regarding pregnancy, nursing and administering Pindolol to children or the elderly? Some products that may interact with this drug include: alpha-blockers (e.g., prazosin), arbutamine, other beta-blockers (e.g., atenolol), clonidine, epinephrine, fenoldopam, fingolimod, thioridazine, other drugs for high blood pressure (e.g., methyldopa, reserpine), drugs affecting liver enzymes that remove this medication from your body (e.g., amiodarone, chlorpromazine, St. John's wort). Does Pindolol interact with other medications? 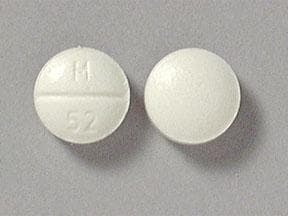 This medicine is a white, round, scored, tablet imprinted with "M 52". 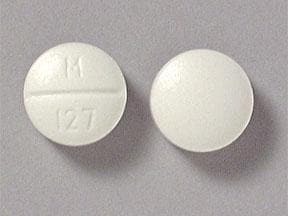 This medicine is a white, round, scored, tablet imprinted with "M 127". 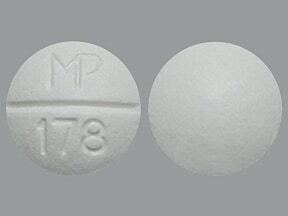 This medicine is a white, round, scored, tablet imprinted with "MP 178". 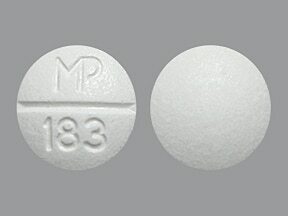 This medicine is a white, round, scored, tablet imprinted with "MP 183". Are you considering switching to Pindolol? How long have you been taking Pindolol?